View More In Serveware - Page 10. Every serving reflects your elegant touch. 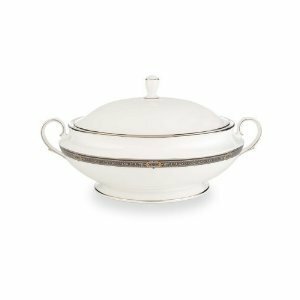 This distinctive serving bowl - with its fitted lid designed to keep food warm at the table - captures the classic style and sophistication of Vintage Jewel fine china. The white-bodied china is embraced by a black and charcoal border, embellished with gold accents and rimmed with precious platinum - for a look of unmistakable elegance. Diameter: 9 1/2"; Capacity: 64 oz. HOME DECOR - "AEGEAN SEA" MURANO GLASS BOWL - IVORY / BLUE SWIRL - 19" X 10.5"